What kinds of services are you going to need? Will a simple gazebo project require an architect or any kind of hydro vacuum excavation work? Granted, a gazebo is a fairly simple project and shouldn’t require any huge pre-planning steps beyond the usual common sense construction plans. Before we start talking about construction, let’s make sure you know what kind of building we’re looking at. A gazebo is a small open-air deck with a roof, that is usually free-standing (not attached to the house) and often enclosed with a railing. 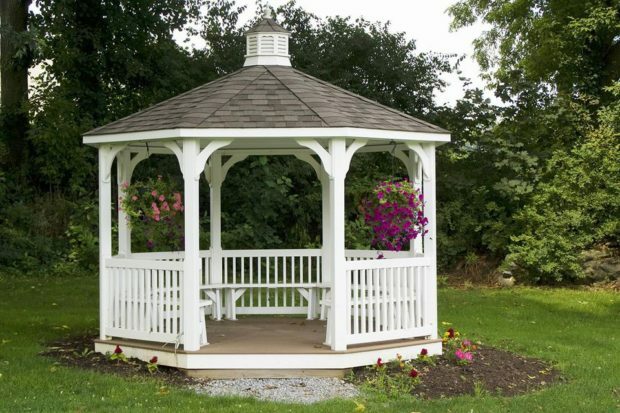 Traditional gazebos are 6 sided but any shape would be considered a gazebo. Now that we’re on the same page, you need to keep a few things in mind before building your gazebo. The classic and most important piece of construction advice applies for gazebos as much as it does for sheds, pools or decks. Unless you are building a very simple model that requires no footings or foundations at all, you will be doing some amount of digging, and that means calling the utility companies. You can either call all of your utility companies directly, or use your local “Call Before You Dig” line for one-call assistance. These steps are usually required by law, so don’t just ignore it. If you end up cracking a gas main or splitting a phone cable, you are liable for legal consequences if you didn’t take these steps. You can also call a survey company to actually come out and check out your site if you think there may be other underground obstacles besides utility lines. A gazebo may not be considered a building given the fact that it doesn’t have walls, so your local permits may or may not be an issue. If gazebos are considered out-buildings, you might still be able to do your project without a permit if the size is smaller than 10 feet by 10 feet. That’s pretty small for a gazebo though. You’ll want to talk to your municipal or council office to see what you need to do. They’ll likely want to see a rough sketch of where the gazebo is going to be placed on your property as well as some measurements for its size. Obviously you’ll want some kind of plan in mind before you start building, but are you thinking ahead about how big is needs to be? Are you to use your gazebo for just yourself and your morning cup of coffee, or do you hope to do some entertaining with a few more people on occasion? Don’t forget to account for garden chairs and maybe a table too. What about location? Do you need it close to the house or would it be suitable out at the end of the yard? Just like when you are building a shed, sticking to arbitrary plans isn’t a good idea. Always think about your usage to make sure you have a practical building once all the work is completed.